Posted by Dissent at 1:16 pm	Breach Incidents, Business Sector, Hack, ID Theft, U.S.
General: When you register, and at other times, we may collect personally identifiable information from you that may include your name, age, address, e-mail address, credit-card number and facts about your computers, profession, and similar information. We do not, however, knowingly collect personal information from children under the age of thirteen. Surveys: We may conduct occasional online surveys. For example, when you’re within our Web site, you may see a pop-up window offering you the optional opportunity of participating in a survey. These surveys are entirely voluntary and you may easily decline to participate. Web Site Usage Information: We automatically collect IP addresses and Web site usage information from you when you visit our Web site. This information helps us evaluate how our visitors and subscribers use and navigate our Web sites on an aggregate basis, including the number and frequency of visitors and subscribers to each Web page, and the length of their visits. For the purposes for which you specifically provided the information including, for example, to enable us to process, validate and verify subscriptions. To send you e-mail notifications about our new or existing products and services, special offers, or to otherwise contact you. 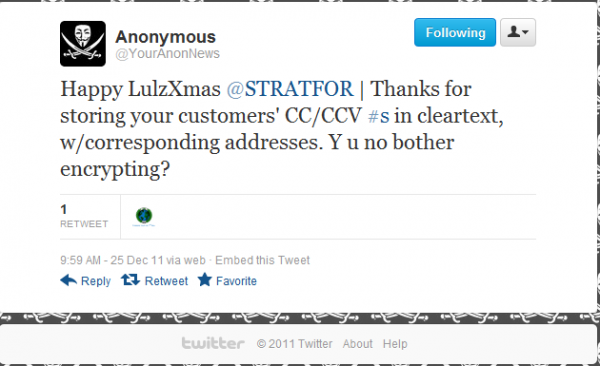 To send you e-mail notifications, through companies who work on behalf of STRATFOR, about certain approved third-party products and services (Unless we tell you differently, these companies do not have any right to use the personally identifiable information we provide to them beyond what is necessary to assist us). To enhance existing features or develop new features, products and services. To provide advertisers and other third parties with aggregate information about our user base and usage patterns. To allow us to personalize the content and advertising that you and others see based on personal characteristics or preferences. We may combine the information that we collect from you on this Web site with information that you provide to us in connection with your use of our other products, services and Web sites. Pixels: STRATFOR.com uses pixels, or transparent GIF files, to help manage online advertising. These GIF files are provided by our ad management partner, DoubleClick. These files enable DoubleClick to recognize a unique cookie on your Web browser, which in turn enables us to learn which advertisements bring users to our website. The cookie was placed by us, or by another advertiser who works with DoubleClick. With both cookies and Spotlight technology, the information that we collect and share is anonymous and not personally identifiable. It does not contain your name, address, telephone number, or email address. For more information about DoubleClick, including information about how to opt out of these technologies, go to: http://www.doubleclick.net/us/corporate/privacy. STRATFOR gives users the following options for changing and modifying information previously provided. If you have any questions, comments, or concerns about this Privacy Statement, please contact us at 877-9STRAT4. So they pledged to “maintain safeguards to protect the security of these servers and your personally identifiable information.” In this day and age when there have already been so many hacks and hackers have made their intentions clear, I think some might reasonably be shocked or consider it negligent that Stratfor not only stored so much data but failed to encrypt it. Is this how companies demonstrate that they are “committed to maintaining the privacy of personal information?” If so, I am not impressed.